The British pair filmed the clip for their bouncy single in South Africa. Poet, rapper, and singer-songwriter Tiggs Da Author is following up his bouncy debut single "Georgia" with the infectious "Run." Featuring some grin-inducing bars from Lady Leshurr, "Run" is the Tanzania-born, London-based artist's carefree anthem, with a video shot in South Africa—aka the perfect watch for a grim January day. "The song is about escaping your troubles and just getting away from certain situations," Tiggs told The FADER over email, "not letting life's little dramas bring you down. Sometimes it's better to just run!" 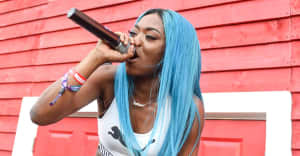 Leshurr added: "This song makes me happy! I love that it can be played to all ages. It’s a feel good vibe and I love that. Working with Tiggs felt so natural, his smile is infectious just like this song.” "Run" is out now.